Glow in the dark crystals are brightest if the crystals are clear rather than colored. 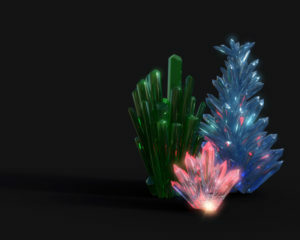 If you think regular crystals are boring, try growing glow in the dark crystals. These magical creations are easy to make, but you need to apply a bit of science to get them to work. If you’ve purchased glow in the dark crystal kits, most likely (based on the negative reviews I’ve read), you’ve been disappointed. Even though the kits are expensive (about $10), they don’t include great ingredients. You pay for packaging, advertising, chemicals, “free” fluorite, and product development. When you buy a kit, you may get too little or low quality glow chemicals and poor-to-wrong instructions. While the chemicals used to grow crystals are inexpensive, the ones added to make them glow in the dark are not. Worse, they don’t play well with water. What do you dissolve the crystal powder in to grow the crystals? You guessed it — water! The other problem is the compounds that make something really glow in the dark (phosphorescence) are contaminants to crystals. Crystallization is one form of purification, typically excluding most contaminants. 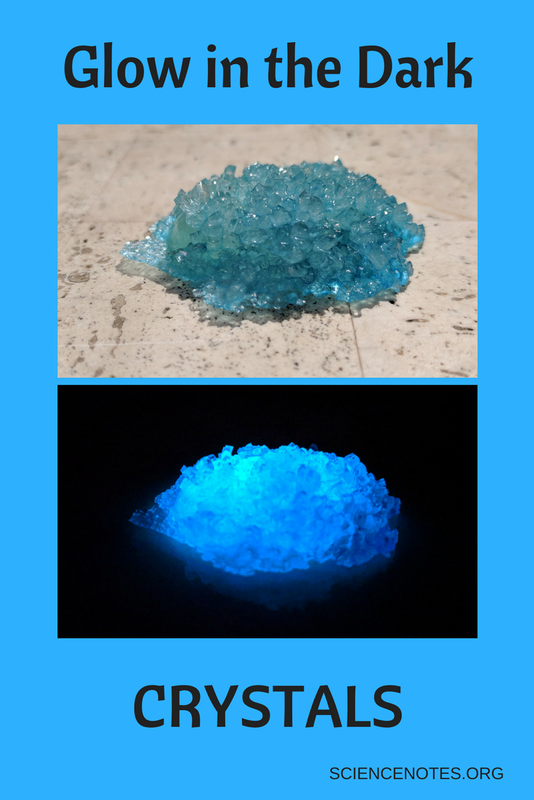 If you put glow powder in a crystal solution, some of the “glow” may stick to the outside of the crystal, maybe a tiny amount even gets incorporated into the crystal, and most of it gets washed down the drain. The crystal may glow, but the light will be so dim it will be hard to see. The kind of crystal that glows under a black light (fluorescent) often work better because you don’t need to get as much of the chemical into the crystal. A black light supplies the energy to produce light. How do you overcome these problems? The crystal kits that work give you a phosphorescent “rock” base on which to grow the crystals. Usually the crystal powder produces a clear solution because any color in the crystals diminishes the glow. Also, coloring the crystals makes it harder to charge the glow powder. Phosphorescent molecules need energy, preferably from the Sun or a black light. They absorb this energy and slowly release it in the visible range (glow in the dark). Basically, the crystals grow over a glow-in-the-dark base. These are sugar crystals that glow in the dark. I colored the crystals using food coloring. These are non-toxic! Now you know why kits don’t usually work well and how not to grow a glowing crystal. You’re ready for success growing crystals that do glow. You can use any crystal-growing recipe. Good options include ammonium phosphate (stuff in the kits), alum (sold with cooking spices, but expensive), borax (inexpensive; sold as a laundry booster or insecticide), sugar, salt, or Epsom salt (inexpensive; sold in pharmacies). You are going to grow the crystals around the glowing base. You can color your crystals, but remember: the deeper the color, the dimmer the glow! To get a good glow, use a brightly phosphorescent object. I used a glow-in-the-dark plastic rock. Test your glowing base to see whether it sinks or floats in water. My “rock” floated in the crystal solution, so I had to sink it to grow crystals. Stick your base to the clear container you’re using to grow crystals. Don’t stick the base using an adhesive that dissolves in water. If you can control the way your object floats, consider letting it go ahead and float, with the side you want covered facing down into the liquid. Why use a clear container? It’s so you can watch the crystals grow! Boil enough water to fill the container so that it covers the glowing base. The more liquid you have over the base, the more room the crystals have to grow. They won’t grow out of the liquid, so plan accordingly. Pour the boiling water into a separate container and stir in the borax or sugar or whatever you’re using until no more dissolves. Then, add a bit more for good measure. You want to saturate the solution. If it’s not saturated, you won’t get crystals until the excess liquid evaporates. That can take forever (days, weeks, months). If you want colored crystals, add a bit of food coloring. Neon green or blue are good choices. Try to pick a hue that close to the color of the glow from your base. Let the crystal solution cool a bit so it won’t burn you if you spill it. Pour it through a paper towel over your base. (Note: If you use sugar, the liquid will be too thick to filter. That’s fine, just be aware.) The purpose of the paper towel is to filter out undissolved solids (and cat hair, in my case). Set the container in a place where it won’t get jarred or disturbed. You can place a coffee filter on top of it to keep out dust, but don’t seal it. Evaporation is your friend. You’ll get the biggest crystals if the liquid cools slowly. You’ll get small crystals quickly if you cool the solution quickly (e.g., refrigerate it). 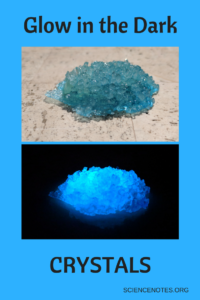 If all of this sounds like too much work or you have a pretty crystal you’d like to make glow, you can simply paint the base of the crystal with phosphorescent paint, glue, etc. This works best with a clear or at least translucent crystal. You don’t have to paint the entire surface because the light will travel outward to illuminate the crystal. How Long Do the Crystals Glow? The size of the particles also matters. Bigger glowing particles hold a charge better than finely ground pigment. So, before you go to all the trouble of coating a plastic glowing star or a glowing glass marble, make sure you’re happy with the color, brightness, and longevity of the glow. Personally, I like to make my own “rocks” by encasing glowing sand in resin. That way I can control the brightness and color. You can use whatever is handy or make your own rocks.